South Korean shipbuilder Hyundai Heavy Industries (HHI) has received Approval in Principle (AiP) from Lloyd's Register (LR) for a very large gas carrier (VLGC) design capable of using liquefied petroleum gas (LPG) as fuel. LPG presents advantages over marine diesel oil (MDO) and heavy fuel oil (HFO) when a VLGC is able to utilize the LPG cargo on board as a fuel. However, safety issues need to be thoroughly examined particularly in relation to potential leaks of LPG in a confined space and the implications for ventilation. It is critical when considering the system design that, in the event of a leak from the fuel system any leaked LPG is prevented from collecting inside the vessel, especially the confined space within the engine room considering the 'heavier than air' property of LPG, LR said. The AiP, which was presented to HHI on Wednesday during a presentation at Gastech - the exhibition and conference for the global gas, liquefied natural gas (LNG) and energy industries in Barcelona, Spain - marks the first time the shipyard has received an AiP for LPG as a fuel design, as per the new IGC code. It opens up the way for VLGC operators, who, like the rest of the industry, face the challenge of reducing GHG emissions. 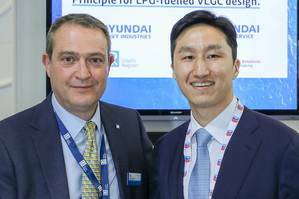 Kisun Chung, Deputy COO in Group Ship/Offshore Marketing of HHI and CEO in Hyundai Global Service, said, "We have focused on developing the safe design for LPG-fueled propulsion system. We are pleased to introduce the reliable design of VLGC with LPG burning system in the market for new building and also conversion vessels so that VLGC players can have environmentally-friendly vessels and maximize their benefits using their cargo carried onboard the vessels." The development was the result of collaboration between HHI, Hyundai Global Service (HGS) and LR, which facilitated a high-level hazard identification (HAZID) workshop for the LPG fuel supply system and associated ancillaries in accordance with LR's established ShipRight Procedure Risk Based Designs (RBD). The concept design has been examined in conjunction with the result of HAZID. Jin-Tae Lee, Ph.D, Korea Chief Representative & Marine Manager, LR, said, "We are very pleased with our role in this JDP to help the shipyard develop the reliable LPG-fueled VLGC design free of latent risks due to the inherent LPG characteristics, and to enable the shipping industry to enjoy the commercial benefits with confidence in the safety and operability of the LPG burning system." MAN Energy Solutions (MAN ES) participated in this joint development project as an engine designer. MAN ES recently launched its latest two-stroke engine type, a dual-fuel MAN B&W ME-LGIP engine designed for LPG running. MAN B&W ME-LGIP engines are designed for dual-fuel operation with LPG as a low-flashpoint fuel. The LGIP concept is also suitable as a retrofit solution, applicable for more than 3000 ME-C type engines in service. René Sejer Laursen, ME-GI/LGI Promotion Manager of MAN Energy Solutions, stated, "In the future it will be difficult for some ship types to meet emission requirements without using gas as fuel, such as ethane, LNG and LPG. By using gas as fuel there is the potential to achieve 20 percent more power." HGS was also involved in this joint development project, HGS is a subsidiary of the HHI group specializing in providing all round services in marine, offshore and the power generation segment. Recently, HGS has been working with major global shipping companies on the feasibility for conversion of LPGC vessels to LPG-fueled propulsion systems in response to the upcoming environmental regulations. To pursue customer needs HGS has stepped up as a pioneer for eco-friendly retrofit solutions. As HHI and LR have now successfully completed the JDP, HGS is one step closer to providing safe and beneficial conversions for LPG players.